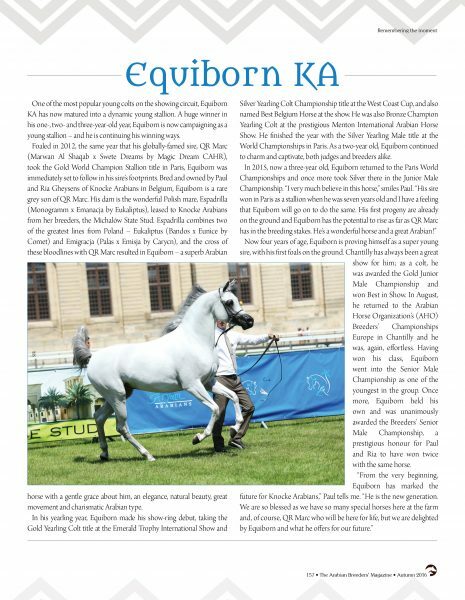 Celebrating the Champions – Equiborn KA. One of the most popular young colts on the showing circuit, Equiborn KA has now matured into a dynamic young stallion. A huge winner in his one-, two- and three-year-old year, Equiborn is now campaigning as a young stallion – and he is continuing his winning ways. Foaled in 2012, the same year that his globally-famed sire, QR Marc (Marwan Al Shaqab x Swete Dreams by Magic Dream CAHR), took the Gold World Champion Stallion title in Paris, Equiborn was immediately set to follow in his sire’s footprints. Bred and owned by Paul and Ria Gheysens of Knocke Arabians in Belgium, Equiborn is a rare grey son of QR Marc. His dam is the wonderful Polish mare, Espadrilla (Monogramm x Emanacja by Eukaliptus), leased to Knocke Arabians from her breeders, the Michalów State Stud. 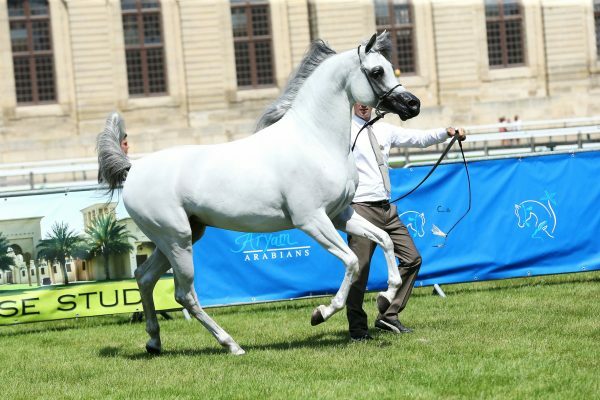 Espadrilla combines two of the greatest lines from Poland – Eukaliptus (Bandos x Eunice by Comet) and Emigracja (Palas x Emisja by Carycn), and the cross of these bloodlines with QR Marc resulted in Equiborn – a superb Arabian horse with a gentle grace about him, an elegance, natural beauty, great movement and charismatic Arabian type. In his yearling year, Equiborn made his show-ring debut, taking the Gold Yearling Colt title at the Emerald Trophy International Show and Silver Yearling Colt Championship title at the West Coast Cup, and also named Best Belgium Horse at the show. He was also Bronze Champion Yearling Colt at the prestigious Menton International Arabian Horse Show. He finished the year with the Silver Yearling Male title at the World Championships in Paris. As a two-year old, Equiborn continued to charm and captivate, both judges and breeders alike. Equiborn KA. Credit Ricard Cunill. Now four years of age, Equiborn is proving himself as a super young sire, with his first foals on the ground. Chantilly has always been a great show for him; as a colt, he was awarded the Gold Junior Male Championship and won Best in Show. 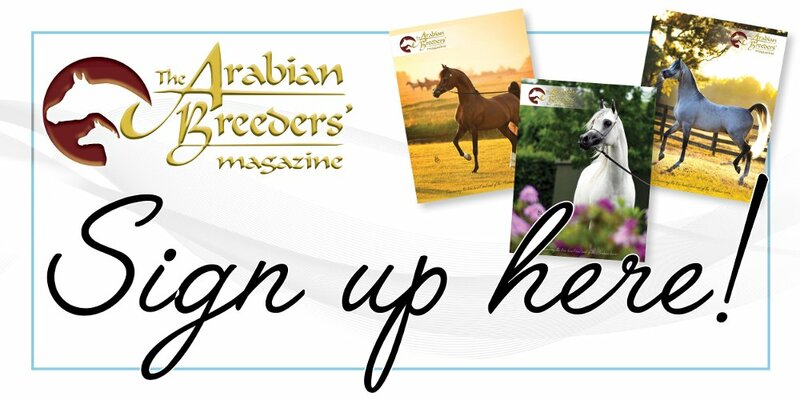 In August, he returned to the Arabian Horse Organization’s (AHO) Breeders’ Championships Europe in Chantilly and he was, again, effortless. Having won his class, Equiborn went into the Senior Male Championship as one of the youngest in the group. Once more, Equiborn held his own and was unanimously awarded the Breeders’ Senior Male Championship, a prestigious honour for Paul and Ria to have won twice with the same horse.